Renaud Gay is a French musician focusing on the use of traditional instruments. 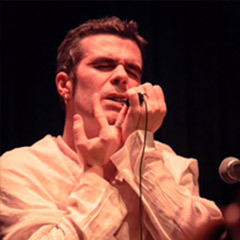 Renaud has been playing world music instruments for more than 15 years in different projects, venues and with different artists from all around the world. In 2010 he founded SoundScape Crew in Shanghai, China, a project gathering world musicians from different cultures around the idea of a modern blend of traditional sonorities. He believes that traditional instruments are the living memories of mankind’s heritage, expressing the deepest interactions between humanity and the environment they live in. Renaud’s style is that of a free modern approach. He fully enjoys improvisation and relies on the truth of the moment where only the present gives shape to the music. – Algoza: Algoza is a pair of flutes adopted by Sindhi, Rajasthani and Baloch folk musicians. Sound is generated by breathing into it rapidly. The quick recapturing of breath on each beat creates a bouncing, swinging rhythm and mesmerizing melody. – Jawharp: Jawharp is considered to be one of the world’s oldest musical instruments. Positioned between the teeth and with modulation of the throat, lips and breath they produce a wide and amazing range of sounds. “Morchang” is the Rajasthani type played by Renaud, also present in Pakistan under the name “Chang”.